Agnosia: from the Greek: ignorance, "without knowledge", loss of the ability to interpret sensory stimuli, such as sounds or images. 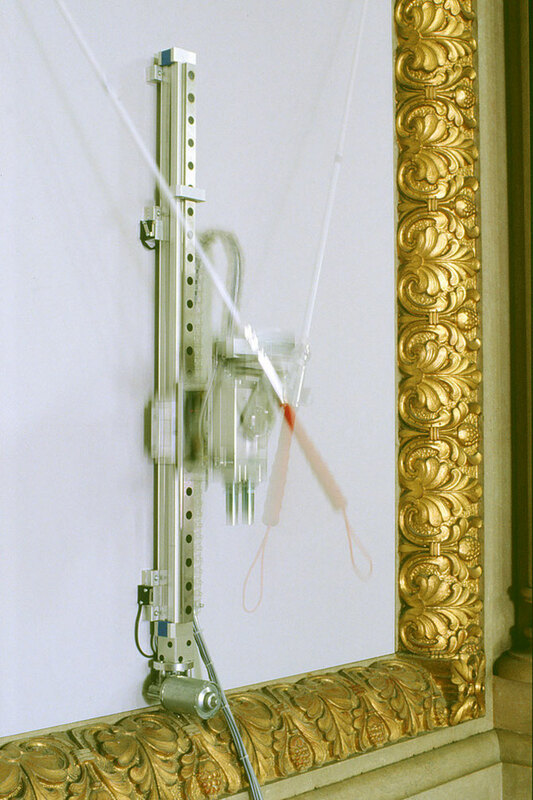 Kinetic blind canes moved by apparatuses, leaving traces of their movements on the floor. 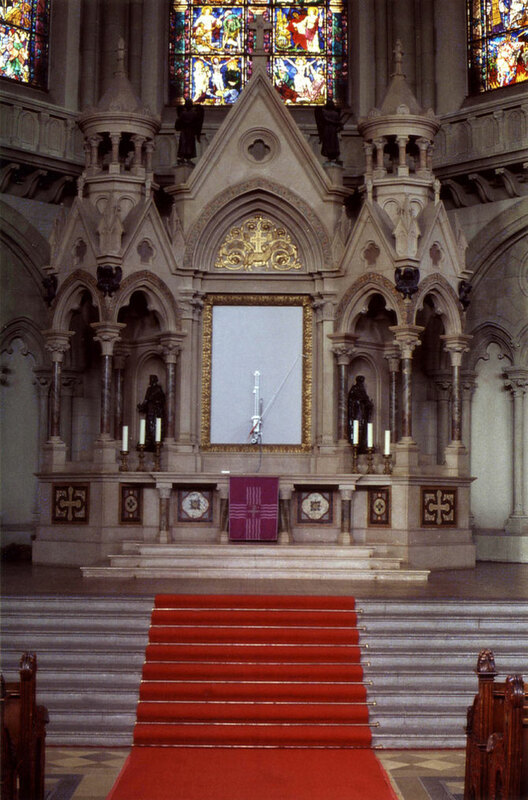 One of these “Agnosia”-works was shown at a church in Munich for two months as an altar image above the altar. The old painting was covered and a white plane was applied. 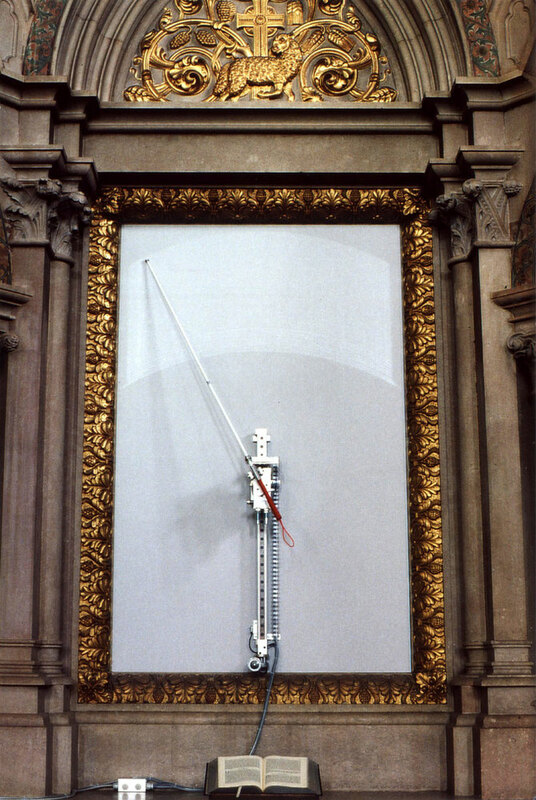 This installation took place during easter (to refer to the crucification and the image which was covered by this “blind spot”, this iconoclasm, but also to the pogroms which often started during easter-times). 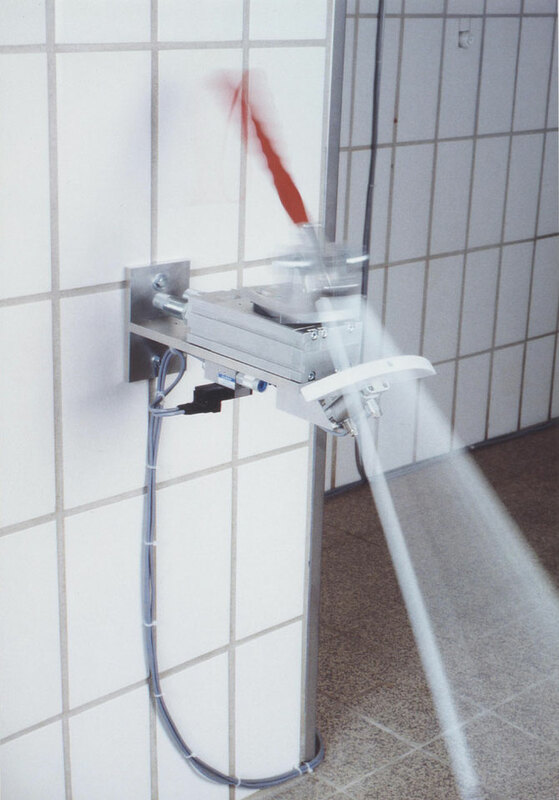 The starting point for working with the blind spot was probably a white plane (area whitened out) at the former synagogues’ place for the torah scrolls at Ehemalige Synagoge Drensteinfurt - I made a breathing installation there in 2000 called “Ruach” (wind, spirit, holy spirit). This white plane refered to the absence of things, of the religious items, of jewish communities in Germany. It refers to elimination. The blind cane sometimes is pointing in space, as a kind of searching or pointing stick: as if the blind leading the blind, pointing out the way. The traces left by the sticks are almost invisible drawings in space, very subtle, only seen if the viewer is keen and curious enough to look closely, affording a wish for finding. Siehe auch unter "Kooperationen" die Zusammenarbeit mit Inga Fonar Cocos, Israel. See also under "Cooperation" the work with Inga Fonar Cocos, Israel. 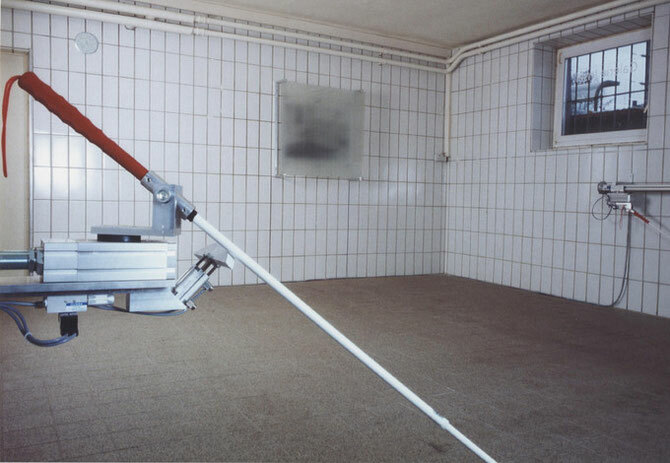 Zustand am Ende der Ausstellung mit erkennbarem Tastfeld des Blindenstocks. Condition at the end of the exhibition with recognizable tactile field of the blind cane. Dieser oben offene "Brillen"-Container befand sich im Eingangsbereich der Kirche. Anfangs befanden sich darin nur einige Brillen aus der Familie des Künstlers. Am Ende der Ausstellung war der Container annähernd halb voll, obwohl keine Hinweise und Aufforderungen hierzu zu finden waren. This "glasses" container, open at the top, was located in the entrance area of the church. In the beginning it contained only a few glasses from the artist's family. 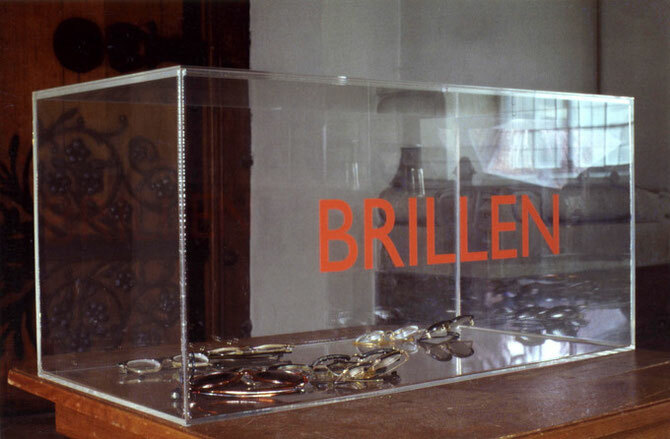 At the end of the exhibition, the container was almost half full, although there were no hints or requests to do so. 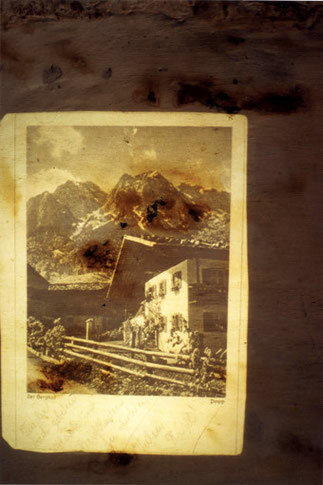 Projektion "Der Berghof (Postkarte Alice Licht)" im offenen Kamin der "ältesten Küche Ulms" in der Ausstellung "Relativ Schön", Kunststiftung Pro Arte, 2004 (die Küche wird auf das Jahr 1563 datiert). Der Küchenraum ist klein und dunkel, der Boden uneben. Verirrt sich ein Besucher in dieses Räumchen, so blitzt unerwartet die kleine Projektion auf und eine Projektionssequenz läuft ab, danach wird der Betrachter wieder in die Dunkelheit entlassen. 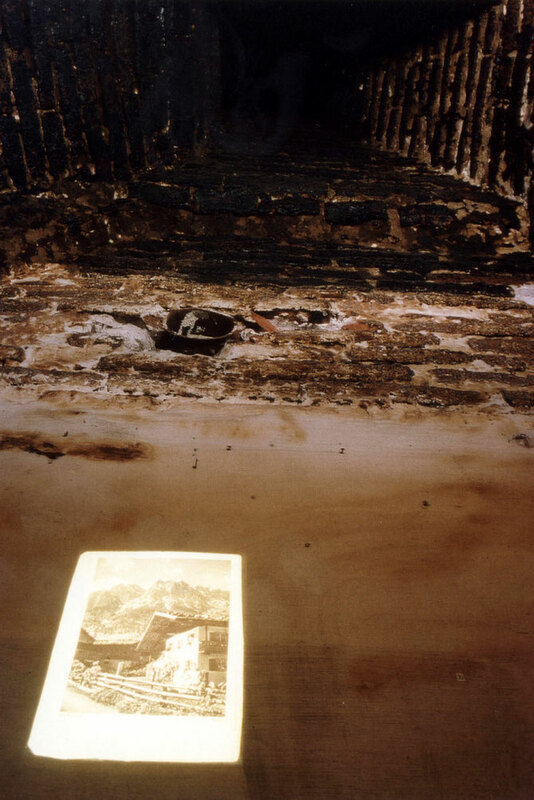 Projection "The Berghof (postcard Alice Licht)" in the open fireplace of the "oldest kitchen of Ulm" in the exhibition "Relativ Schön" (Relatively beautiful), Kunststiftung Pro Arte, 2004 (the kitchen is dated 1563). The kitchen is small and dark, the floor uneven. If a visitor gets lost in this small room, the small projection flashes up unexpectedly and a projection sequence takes place, after which the viewer is released into the darkness again. Bei der Projektion verschwindet das Bild zunehmend im Hintergrund, der bestehen bleibt. Bild und Bildgrund gehen eine Einheit ein. Es gibt verschiedene Projektionsmodi, z.B. auch ein Verdunkeln und ein wieder Auftauchen aus dem Dunkel. Verschiedene Formen des Erinnerns und Vergessens könnten damit assoziiert werden. 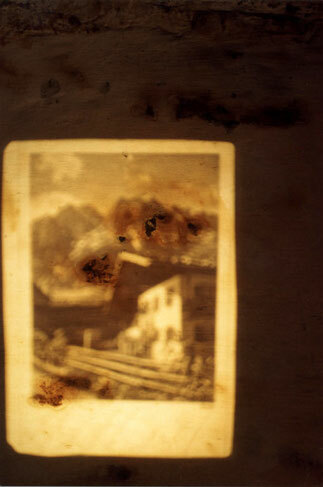 While projecting, the image increasingly disappears into the background, which remains as it is. Image and background form a unit. 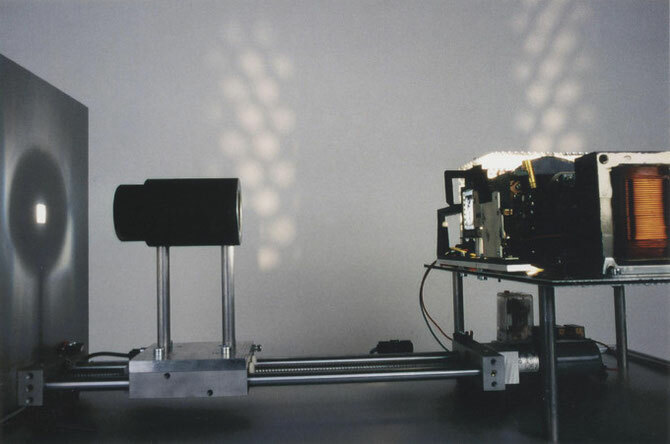 There are different projection modes, e.g. darkening and reappearing out of the darkness. Different forms of remembering and forgetting could be associated with this. Postkarte Alice Licht vom 16. 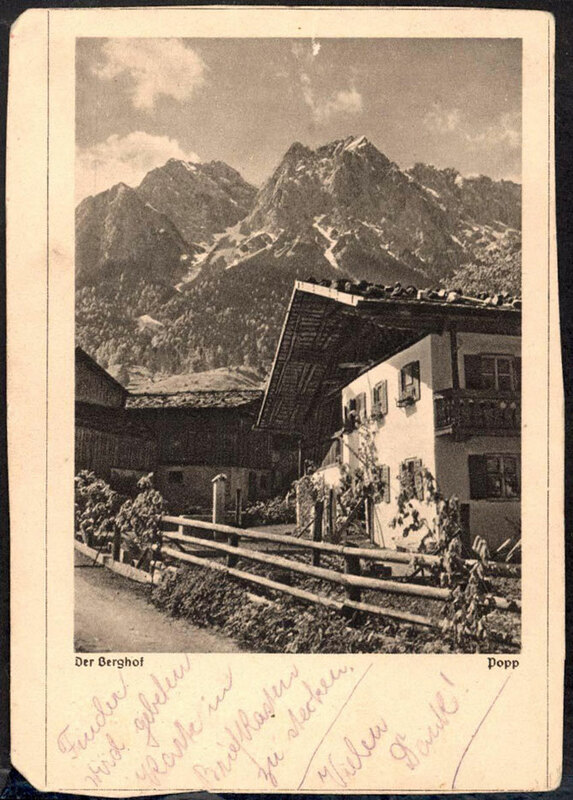 Mai 1944, während des Transports nach Auschwitz-Birkenau aus dem Zug geworfen mit der Aufschrift auf der Bildseite: "Finder wird gebeten, Karte in Briefkasten zu stecken. Vielen Dank! ", bei der Adresse mit dem Vermerk "Strafporto zahlt Empfänger". 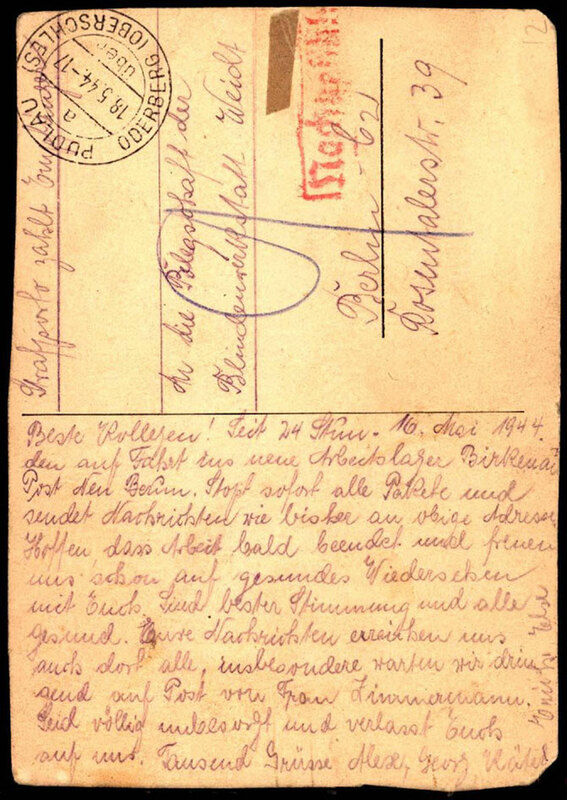 Postcard Alice Licht dated 16 May 1944, thrown off the train during transport to Auschwitz-Birkenau with the inscription on the picture page: "Finder is asked to put card in mailbox. Thank you very much", at the address with the note "Strafporto zahlt Empfänger" (Penalty postage paid by recipient). „Man muss sich beeilen, etwas zu sehen, alles verschwindet." 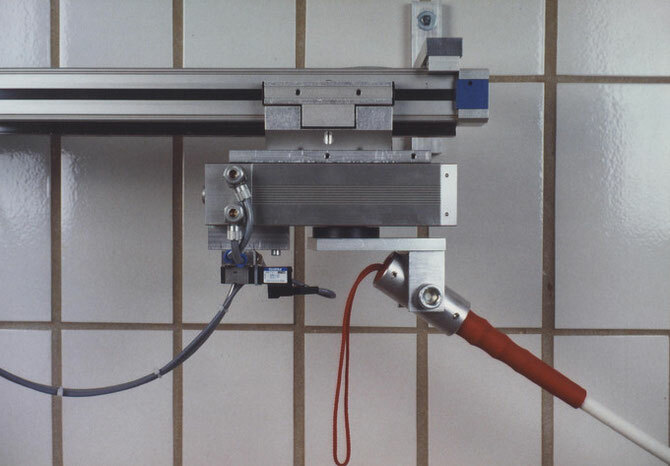 Hinter einer matten, milchig-opaken Glasfläche sind schemenhaft verschwommene Formflächen erkennbar. 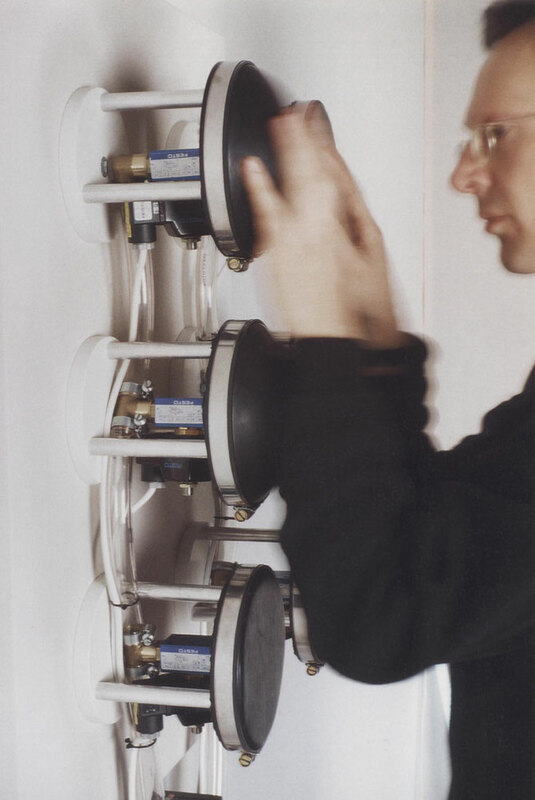 Tritt ein interessierter Besucher nah genug heran, wird die Glasfläche plötzlich transparent und gibt den Blick auf eine dahinterliegende Transparentfolie samt Kachelstruktur des Realraums frei. Mit dem „Röntgenbild" werden medizinische Assoziationen hervorgerufen, man erkennt u.U. einen Sezierraum. Über die Glasoberfläche kommen Spiegelungen, der Betrachter selbst, Um- und Außenraum in den Blick. Thematisch kreist die Ausstellung um den Wahrnehmungsdiskurs, um Möglichkeiten und Grenzen des Sehens, um Gedächtnis und Verdrängung. "You have to hurry to see something, everything disappears." 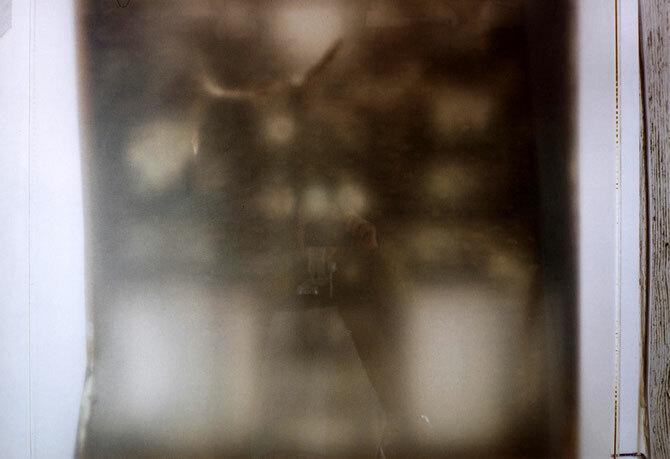 Behind a matt, milky opaque glass surface, schematically blurred surfaces can be seen. If an interested visitor approaches close enough, the glass surface suddenly becomes transparent and reveals a view of the transparent foil behind it together with the tiled structure of the real space. 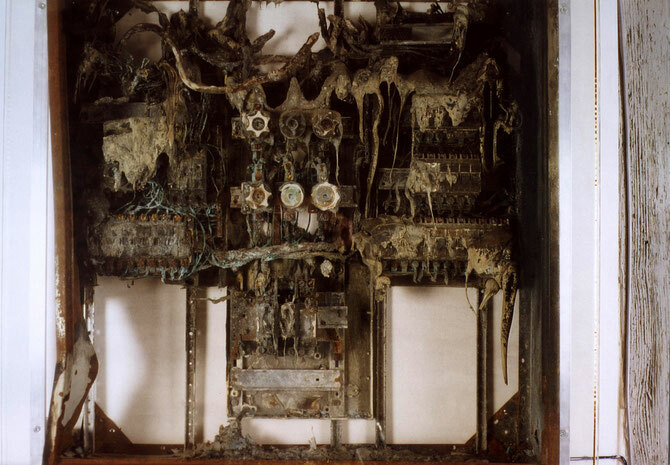 The "X-ray image" evokes medical associations, and a dissection room may be recognizable. Reflections, the viewer himself, the surrounding space and the outside space come into view via the glass surface. Thematically, the exhibition revolves around the discourse of perception, the possibilities and limits of seeing, memory and repression. The "dots" (tactile domes) of this moving braille matrix move back an forth, when somebody lays his hands on them. The text in Braille becomes visible and palpable, the work is tangible: the left palm is placed on the vertical row of three on the left, and the right palm on the right. 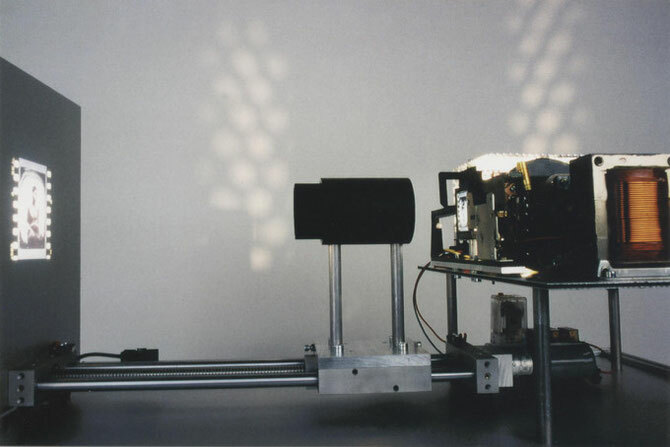 A quote from Paul Cézanne appears, coded in Braille: "You have to hurry to perceive something, everything disappears". Etwa in Brusthöhe befindet sich ein Sechserblock von schwarzen Tastkuppen in der Braille-Grundmatrix; in ihnen wird der Gesamtraum fisheye-artig gespiegelt. 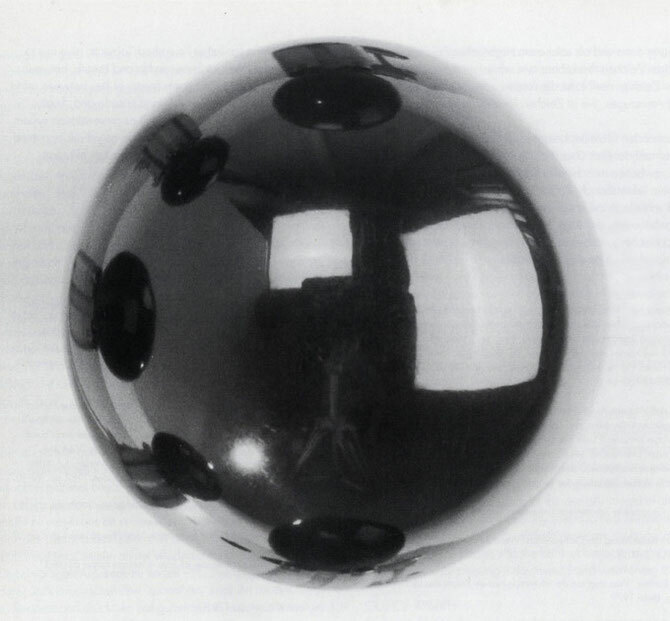 About breast height there is a six-block of black tactile domes in the basic Braille matrix; the entire space is mirrored fisheye-like in them. "More light" were supposedly Goethe's last word on his deathbed. 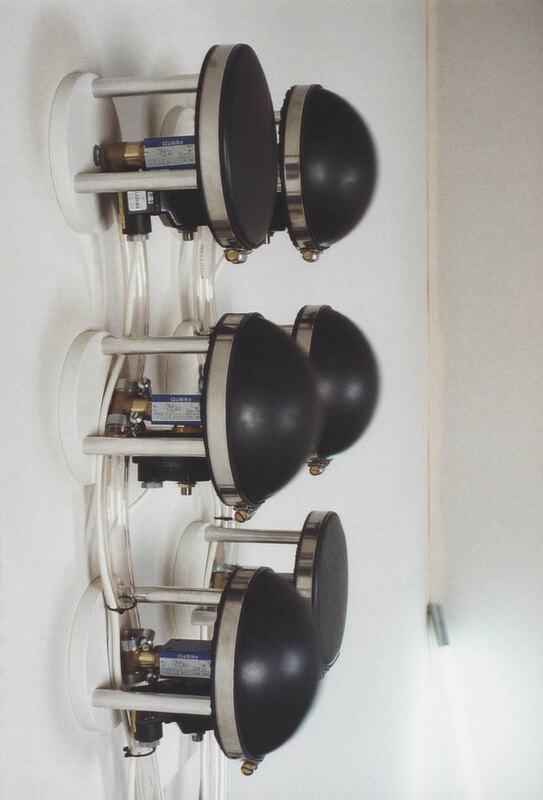 The six small breathing objects ordered according the braille matrix "breath" these two words, while the neon tube in the background gets lighter accordingly. links: der Zählerschrank des Asylbewerberheims war von mir nach dem Brandanschlag aus dem Container "gerettet" worden. Davor befand sich eine Flüssigkristallglasscheibe. Näherte man sich diesem Objekt, so wurde die Scheibe matt, der Blick trübte sich quasi ein, der Zählerkasten war nur noch schemenhaft erkennbar. left: the meter cabinet of the asylum seeker home had been "rescued" from the container by me after the arson attack. 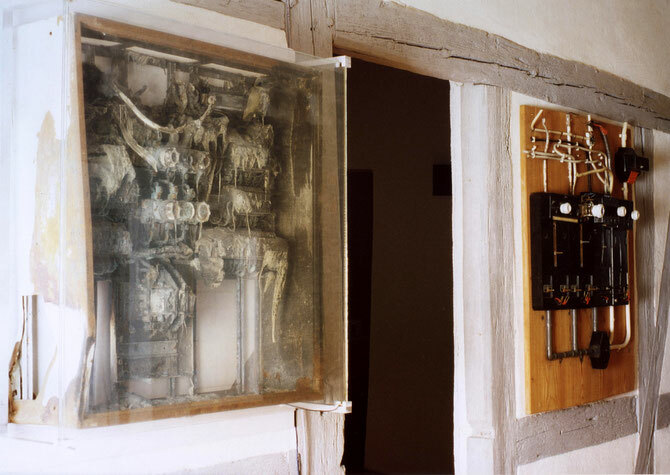 In the exhibition a liquid crystal glass pane was placed in front of it. From a distance it gives clear sight on the object behind. 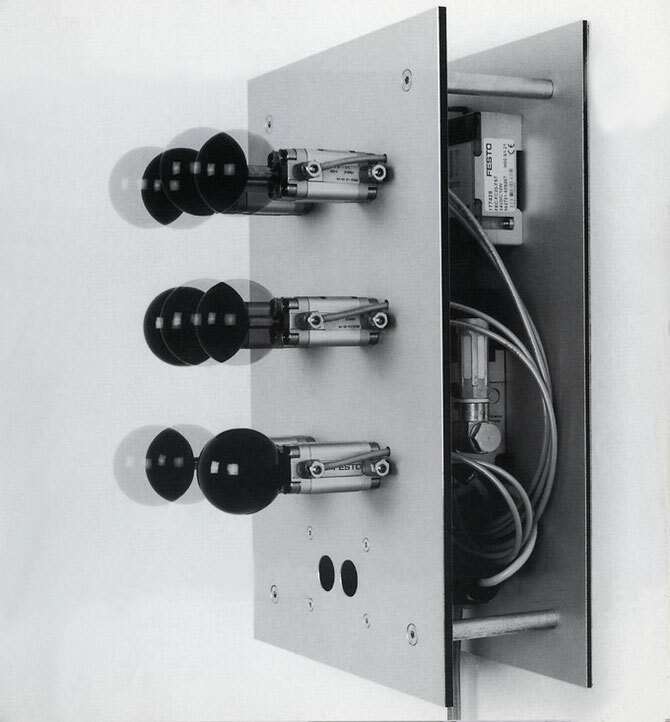 If a viewer approached the object, the glass turned opaque and all details disappeared, the meter box was recognizable.only schematically. The object is only visible from a distance and refuses to be analysed when approached. 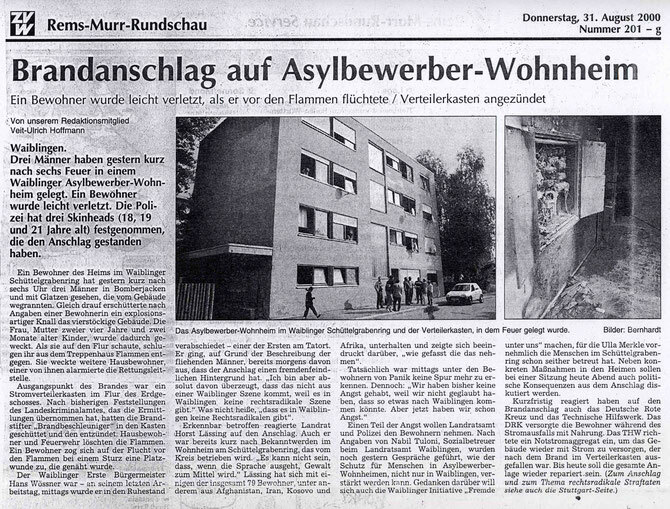 The home for asylum seekers was attacked by neo nazis on August 30, 2000, who tried to burn down the house down by setting fire to the meter box. Zeitungsausschnitt vom 31. August 2000 zu "Blackout"
Newspaper clipping from August 31, 2000 concerning "Blackout"
Sehen Sie weitere Fotos zum Thema "Agnosie" unter dem Reiter "Kooperationen" mit Inga Fonar Cocos und unter "Katarakt"
See further images about "Agnosia" under "Collaborations" with Inga Fonar Cocos and under "Cataract".